Located Walton County, Miramar Beach is a classic beach town along the gulf shore of Florida. With powder-white beaches and warm emerald waves, Miramar Beach is one of the best vacation destinations in the United States. Enjoy water sports like surfing and kayaking, as well as variety of great restaurants and shopping during your Miramar Beach vacation! Learn more here! Coast Is Clear: Brand New Home Will Be Ready The End of February! 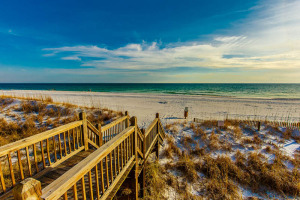 Located Walton County, Miramar Beach is a classic beach town along the gulf shore of Florida. With powder-white beaches and warm emerald waves, Miramar Beach is one of the best vacation destinations in the United States. Enjoy water sports like surfing and kayaking, as well as variety of great restaurants and shopping during your Miramar Beach vacation! Miramar Beach is a great beach town located in Walton County, Florida. One of the "Top 15 Beaches to Visit in South Florida" according to VisitSouthWalton.com, Miramar Beach has clear waters and white, sandy beaches. One of Miramar Beach's most attractive features making it a popular vacation destination is that it is reminiscent of a classical beach town, with colorful shops and beach houses dotting the shore. This can be seen as you drive along the scenic Gulf Drive, a gorgeous detour that gives you a spectacular view of the Gulf of Mexico. There are many fun, family-friendly things to do in Miramar Beach, only a short walking distance from your beach house. If you vacation in October, don't miss out on your chance to go to one of the most anticipated local events of the season: The Best of the Emerald Coast Celebration at Grand Boulevard, the Emerald Coast Magazine's annual Reader's Choice Poll for the best restaurants, shopping, etc. All proceeds go to the Junior League of the Emerald Coast. When you're ready to hit the waves on your vacation, Miramar Beach is great for surfing, jet skiing, wave running, and kayaking. The Ride on Surf School is full of certified instructors ready to teach the whole family to surf and stand-up paddleboard. And if you're interested in parasailing, you can rent out equipment by way of a company called Sky Pirates Watersports. After you're out of water, you can go shopping at The Silver Sands Factory Stores Outlet near your beach vacation house for great bargain deals, and finally end the day by dining at a local restaurant like Pompano Joe's, revered by all for its amazing Caribbean-style seafood. 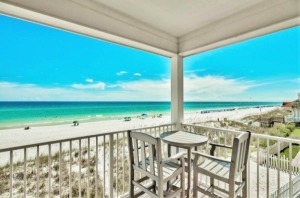 Come book your next vacation at Miramar Beach through Beachhouse.com for your opportunity to stay in a comfortable beach vacation house minutes away from all of the above and more!